As much as I love the woods, I probably wouldn’t go there nearly as much if I had not had such incredible angel beasts in my life. The love and responsibility for these canines kept and keeps me on the trails and in the present! Having frequent contact to the woods has kept me in touch with nature. And nature keeps me in touch with a connection I would never make unless I visited the forest. Though I’m able to categorize and find names for all its parts; when I go there, I feel a wildness beating and somehow know that I’m connected to it. The connection makes me feel strong, alert and apart of the incredible invisible energy force that fills the universe. And watching The Way of Animals always puts me on a precious path! What could possibly be better than a walk in the woods? When I’m there, nothing is better. The sights and smells; lush greens and wild flowers, I inhale and the fragrance of the wilderness fills me with a wild embrace and I never want to leave the woods. 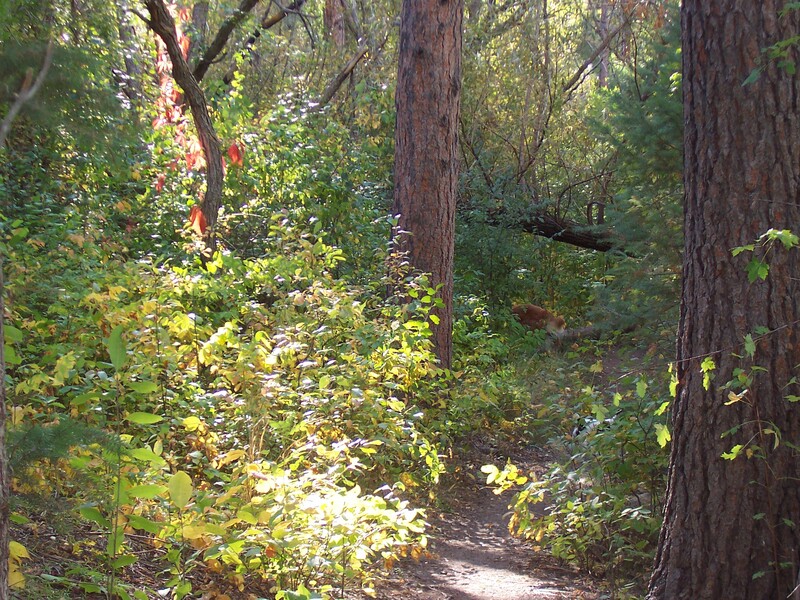 The trail is shaded with lush wild green; scrub oak, spruce and pine. Wild flowers are abundant; Fairy Trumpets, Mouse Eared Chickweed, Evening Primrose, Fireweed, Shooting Stars, Globeflower and Paint brush. A creek weaves in and around the trail as the trail winds its way up the mountain. I believe humans who do not make frequent journeys into the wilderness; touch, smell and listen to the forest, can not truly understand our connectedness to this beauty. We need to embrace the wild. When did asphalt trails, plastics, synthetics and technology become more desirable? Lets take a journey. Lets leave the city behind. Find some green. Get as close as we can, as frequently as possible to nature. Discover our connectedness with our animal friends and the wild beauty of the woods…come with me as I try and hold onto and keep close to the wild within. I know your lifestyle at the moment is overflowing…do hope you will find a way to integrate 30 minutes a few times a week into a short walk up the little trail past the Morhs; sit on a rock with K and just listen with Zeb and Ani. ABsolutely agree with you. THough I dont know how to put it clearly but on our first trip to a wildlife sanctuary in the middle of woods I began to cry as I rode an elephant to watch the woods, the animals and their extreme tenderness.It seems that life would pass me by if I miss nature. Miss its direct ,soft touch and sounds and wise reasons. Will keep reading you. THanks a lot. Dear roopa esther, thank you for taking time to express your feeling here. I get a little choked up when reading your reply…and know i have found a kindred spirit. Blessings. Now I get why your tag is Gailstrail. Fits you. Nice photographs. You live in a beautiful area. I agree with how what you say about the wilderness feeding our soul. People don’t understand that. I hope they figure it out before it is all gone. Thank you Susan. I got the name ‘Gailstrail’ from my friends. Hope you will visit again. Still dont get your name if you called it gaily trailing, it might have made sense. We will go to the GIR lions sanctuary this winter.WIll write about it. Frankly, I envy the great consciousness that AMericans have for nature ,climatechange, ecology etc. It is heartening to see people in videos and news clips doing their bit like sorting bio and non degradable garbage, the tremendous interest and alacricity about petitions for bettering the abovementioned elements. et al. We dont have such a movement here.THose who do actively engage in these pursuits are looked upon as some kind of losers without regularly paying jobs,and a little “conked” , not haveing a future ahead etc. Thank you for visiting. You can call it Gaily Trailing if you like, whatever makes sense for you. I use the name Gailstrail, as it was given to me by friends. I understand from visiting your site that in India, noida, the challenges you face with regard to awareness and consciousness for nature and climatechange, ecology etc. may not be at the forefront in your country. Yes, many in America have great consciousness about these issues…our technology and media make it easy for people to find out about the environment and what they can do to be better stewards. I think what we have in common is that the majority of people in general are in survival mode and have difficulty integrating environmental concerns into their daily lives. As conscious as many are here, there are quadruple the numbers who simply don’t care about the environment. How else would we have arrived at the ‘global warming’ we face? Thank you for all you do to make this planet better for all of us. Dear Monte Alford, thanks for your good luck wishes and stopping by. If you enjoy…perhaps you would like to Subscribe and be notified when I publish a new article. Thanks again.